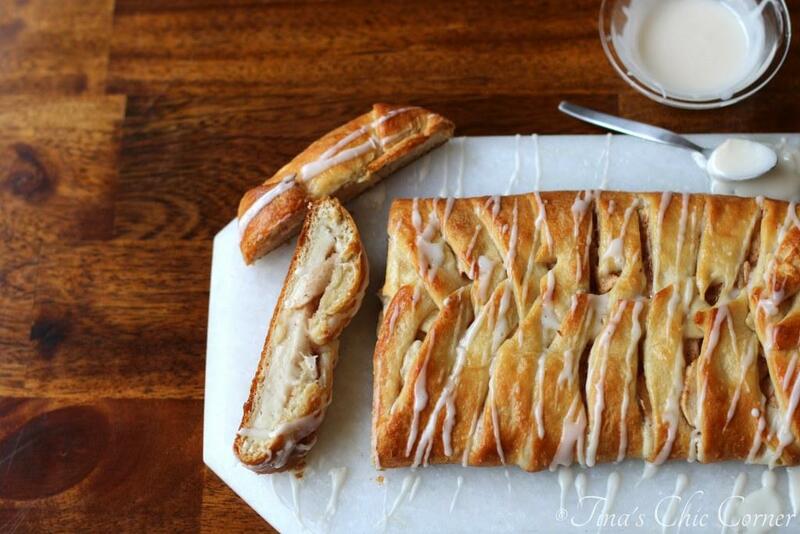 If you’re looking for a Fall time dessert to impress someone then this is it. Not only is it one of the best apple desserts that I’ve ever had, it’s also one of the prettiest! 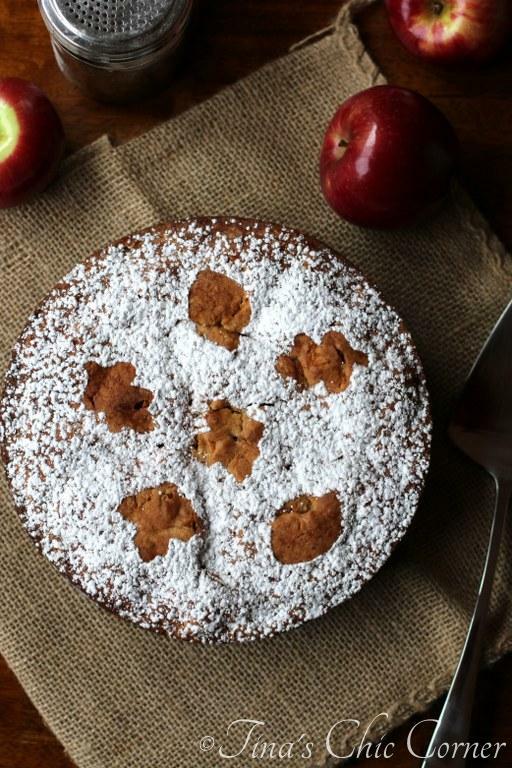 This cake is loaded with apples (duh, it’s called apple cake). I guess what I mean to say is that you definitely know that you’re eating apple cake because every bite is loaded with pieces of apple. Some apple cakes only sort of taste like apples or the spices that would go in an apple pie. This one is actually loaded with real live apples. Didn’t I say this cake was gorgeous!? This dessert is like a combination of a regular cake, a cheese cake, and an apple pie. Remember those apple bits I mentioned? They’re coated in a sugar and spice mix like you would do for pie filling. My mother-in-law always adds both cinnamon and nutmeg in her apple pie and since her apple pie is the bomb digity I had to mirror those warm spices here. Now my apple cake is also the bomb digity. My husband points out that this must be the transitive property of bomb digity-ness. I had to Google it, but he’s definitely got a point. A nerdy point, but a point none the less. This cake is super duper moist, beyond any of the moistest cakes I’ve had before. It’s kind of a wanna be cheesecake in the sense that it’s too moist to be a cake (if that makes sense). It’s definitely not a cheesecake consistency though (just to be clear). Perhaps it’s a hybrid, if you will. Oh, it’s just darn delicous so you’ll have to trust me on this. Don’t feel obligated to make a template using leaf cookie cutters to make pretty patterns on top with powdered sugar. I have been known to go a liiiiiiitle overboard when it comes to these kinds of details. (And also perhaps with the powdered sugar.) 😉 In fact there are lots of choices here. You don’t even technically need the powdered sugar at all. Or, if you do use the powdered sugar, there is no requirement that it be an artistic application. Although I think you should use it on pretty much everything. Whatever your preference, I also recommend a scoop of vanilla ice cream on the side because everything apple deserves that. Line the bottom of an 8 inch round springform pan with parchment paper. Grease the entire pan and set it aside. Peal and chop the apples. 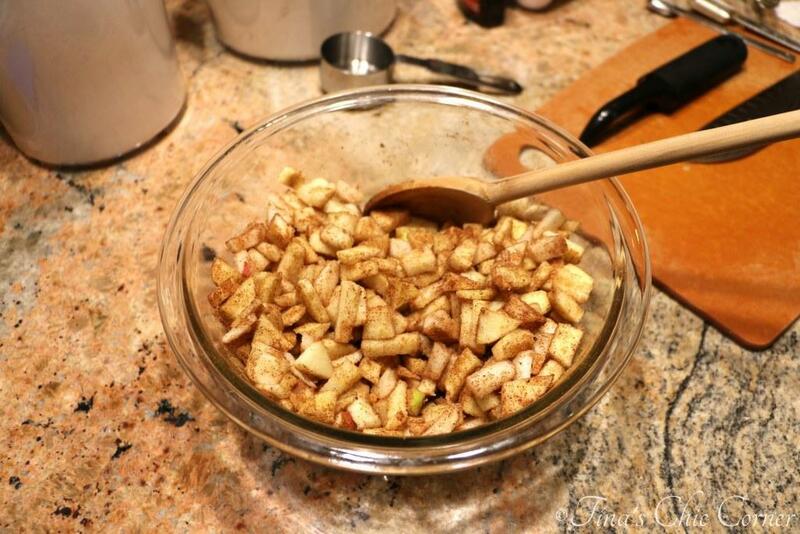 In a medium bowl, mix together the chopped apples, cinnamon, nutmeg, and 1/4 cup of white sugar. Set it aside. In a large bowl, beat together the remaining 1 and 1/2 cups of white sugar, cream cheese, butter, and vanilla extract. Mix in the eggs, one at a time. Set the wet ingredients aside. Gently fold in the chopped apple mixture. Pour the batter into the prepared pan and bake for about 1 hour and 15 minutes or until a tester inserted comes out clean. If you plan to use the powdered sugar as a topping do not apply it until the cake is completely cooled. Here are some other awesome apple goodies. Yarm! This would be just the thing on a crisp chilly night maybe even served warm. Like the cream cheese addition too. I love how moist this cake looks and love your leaf design on top. We have new neighbours that just moved in across the hall. I think this would be a perfect welcome gift. 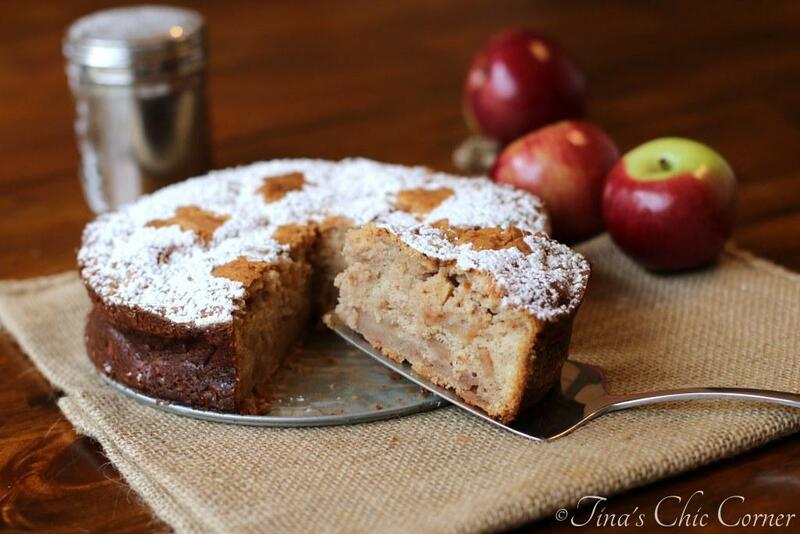 I’m loving this hybrid apple cake/cheesecake/pie, Tina! It’s a little of this and a little of that, but when the this and that are all DELICIOUS and seasonal, it’s a win-win (whatever it’s called). 🙂 Love the powdered sugar design on top, too! Stoppppp. I’m drooling! I absolutely LOVE spice cake. And apples?! Count me in!! This is beautiful! The powdered sugar and leaves on top look great! 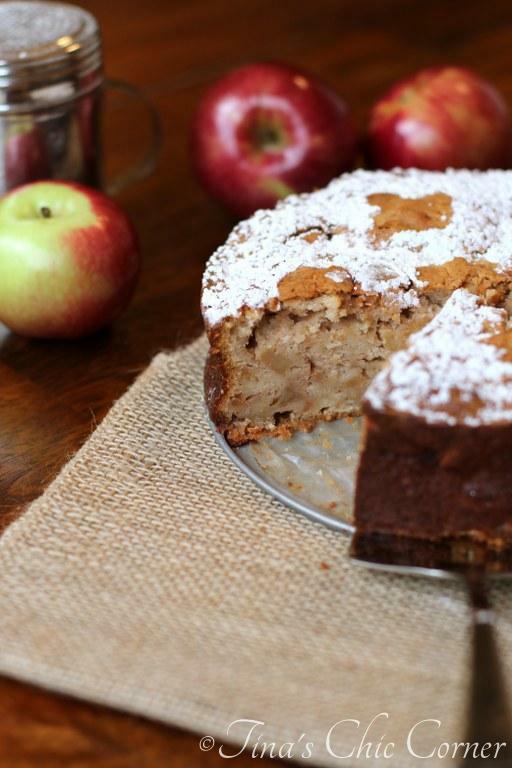 This is probably the best looking apple cake I have ever seen. It look so moist, delicious and full of yummy flavour. Even though it is not Fall (or apple season) here in Australia, I definitely will be making the recipe. Pinned! I have a strong feeling that this is a beautiful cake both inside and out!! It’s got everything going for it really, hasn’t it? It would be fab to serve to guests, but I can just as well imagine having a nice thick slice with a cup of tea on a cold dark Fall afternoon. Love this one, Tina! Whether it be to impress guests or to whip up quick for yourself…it’s a sure winner. 🙂 Thanks, my friend! This cake is gorgeous! 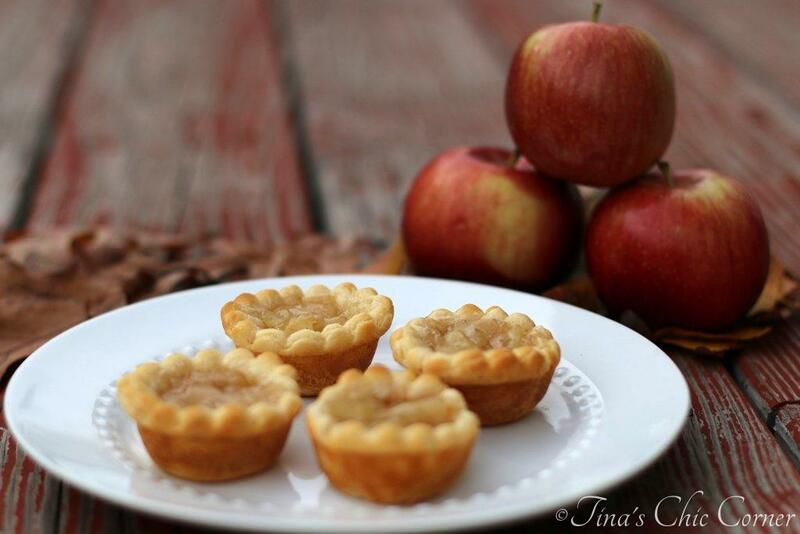 Love apples this time of year, bookmarking the recipe to try out! Great minds think alike – I made apple cake at the weekend too. It’s such a nice comforting dessert, isn’t it. Thank you, thank you! I told my husband that I wanted to bottle up the wonderful aromas from baking this beauty …hehe. 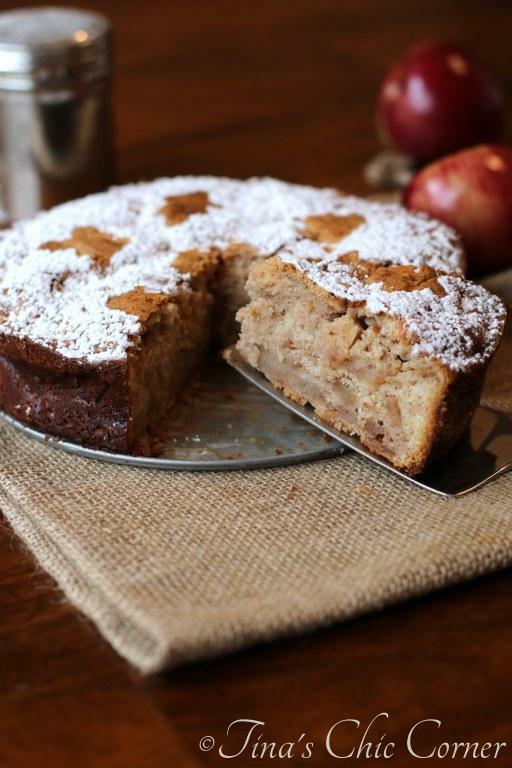 I love apple cake! This one looks so fresh and tasty. Definitely saving the recipe! First visit, Tina. 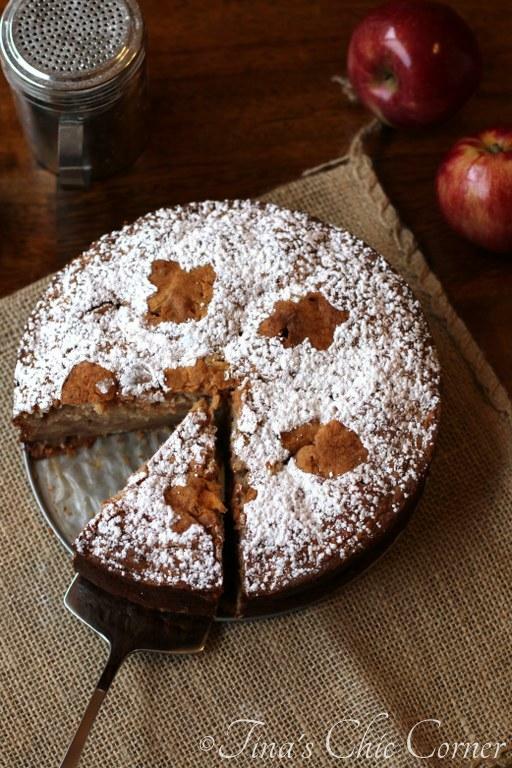 Your apple cake caught my eye and am thinking I’ll have to give it a go, since this is the seasonal cake to impress! I just picked a bunch of apples too… perfect timing! Lovely photography! So glad you stopped by V&B so I could find you! Thank you for this lovely reicpe… I think there is a transitive bomb digity-ness happening, for sure! 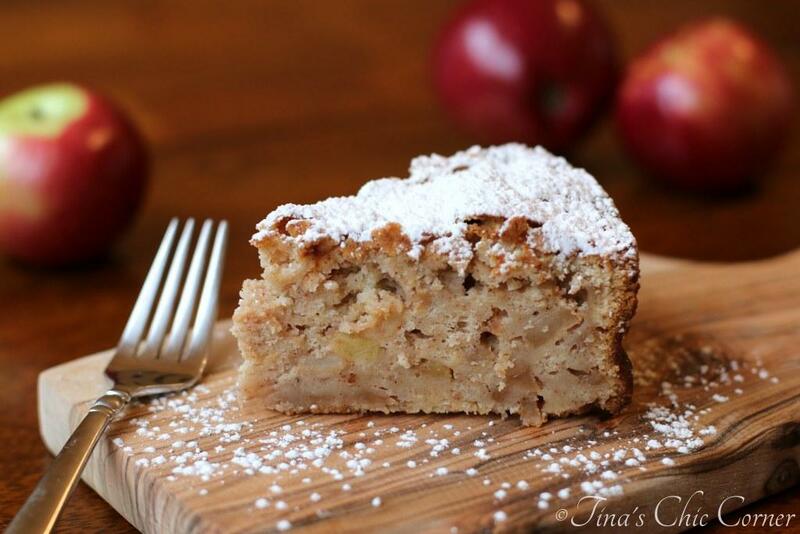 Nothing can beat the flavor of an apple cinnamon cake! Your cake sounds so delcious Tina! This is simply delicious. Everyone asked me for the recipe! It will be appearing on a few Thanksgiving tables, including mine. Thanks for sharing. Oh I’m so excited to hear that! It is one of my favorite cakes of all time. 🙂 Thank you so much for stopping by and sharing!! OMG, this is one of the very best cakes I’ve made!! I make a lot of bakery and this is one of the best. Thank you for sharing your recipe. Make this cake!! Totally delicious!! I’ve made this several times and it’s a winner each time. This cake is WONDERFUL !! Made it for dinner with friends all everyone raves about it. I make lots of cakes but right now this one tops the list! Susan, wow, thank you for your kind words! I’ve made this cake several times for guests and they never object to taking some home. 🙂 I don’t make cake often because I’m horrible at frosting cakes so this one is perfect for me.